Our vision is to create a distinctive new model for education that engages students in the exploration of unanswered questions about major societal challenges. Now a hallmark of the Duke experience, Bass Connections provide opportunities for applied collaborative research across the entire university. In addition to more than 50 year-long project teams each year, there are nearly 40 semester-long courses affiliated with Bass Connections and infused with interdisciplinary, team-based learning. Four summer programs offer additional ways for students, faculty and partners to tackle complex global problems. For some students, the experience of engaged interdisciplinary research confirms initial intellectual directions and career aspirations. For others, participation opens up entirely new paths. 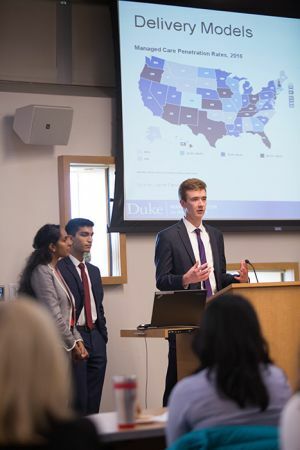 Many incoming students identify Bass Connections as a key reason to attend Duke, and annual evaluations attest to the program’s impact on undergraduates’ identification of academic passions. Graduate students gain leadership and research experience in a team-based environment – important skills for careers inside and outside academia. Many participants take their research further through grants and other opportunities within Duke and beyond. Faculty increasingly see year-long research teams as seed grants that can catalyze important research avenues and new collaborations. Team outputs have shaped decision-making by government agencies, nonprofits and private companies, whether with regard to public health in Peru or autism therapy in local elementary schools.